Human growth hormone plays a major role in brain development and function beginning at the fetal stage. Once adulthood is reached it remains just as important because it is necessary for proper brain function as well as the maintenance and repair of the entire neurological system. One of the most dreaded effects of aging is the decrease in mental capacity. The fields of anti-aging medicine and cosmetic surgery now offer us various ways to improve our looks and shape. However, these improvements would probably mean little to us if our mental clarity, ability to reason, short and long term memories, emotions, sense of well-being, motivation, motor skills such as hand-to-eye coordination, senses, etc., were suspect. We know that the lack of an adequate supply of growth hormone has a detrimental effect on the brain and neurological system and so it is common for those who have suboptimal HGH to experience the symptoms listed above. In the body cells are dying and should be being replaced constantly. It is estimated that about 90% of the body's cells are replaced about every 36 months, with this process slowing with age. The cells of the nervous system are the exception. The brain's main cells are called neurons, and we need for most of these cells to remain with us and to be functional throughout life. The common belief of gerontologists has been that brain cells die at a rate of around 50,000 to 100,000 per day as age progresses. Also, in the past it was believed that the human brain could not grow new cells. However, recent research has shown that new neurons are produced in the hippocampus, the area of the brain where memory is formed and kept. This is great news. As we age the brain does shrink in size. However, Dr. Robert Terry, a neuroscientist at the University of California at San Diego, believes that the brain cells are not dying, they are shrinking. Dr. Terry believes that what is being lost is the dendritic connections between the cells. Dendrites are the branch-like projections of the neurons that reach out in different directions toward other neurons. The small spaces between the adjacent neurons are called synapses. Neurotransmitters jump across these synapses to bring messages into the neuron. As we experience life new connections are made with new messenger molecules being produced within the neurons. This process is supported by nerve growth factor, which is required to maintain the connections in the brain. 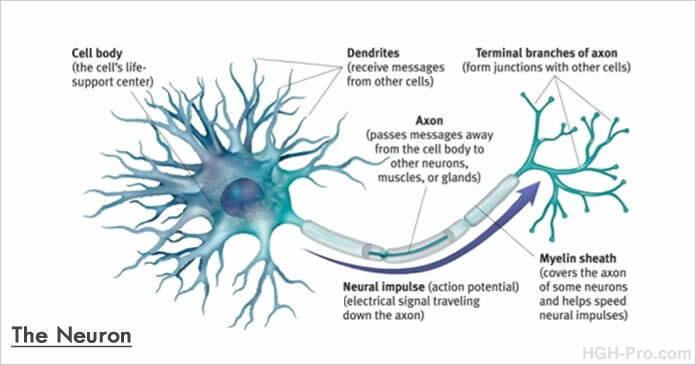 Axons pass information out from the neuron to other neurons and to other parts of the body. Nerve growth factor (NGF) is a small protein that is required for the growth, maintenance, and survival of sensory and sympathetic neurons. Without NGF the neurons will undergo apoptosis (programmed cell death). Nerve growth factor also functions as a signaling molecule. New mounting evidence is showing that NGF also helps to maintain homeostasis throughout the body. Nerve growth factor decreases with age, and also neurons are damaged or die as a result of illness, lifestyle, injury, or environmental issues. These issues play a major role in the decline of mental functioning, and perhaps even Alzheimer's. We now know that human growth hormone and its main growth factor called IGF-1 (insulin-like growth factor 1) can act as a nerve growth factor. A study by Mary M. Niblock, Judy K. Brunso-Bechtold, and David R. Riddle at the Department of Neurobiology and Anatomy and the Program in Neuroscience, Wake Forest University School of Medicine provided evidence that IGF-I can stimulate dendritic growth in the primary somatosensory cortex, which is the region of the brain that receives nerve signals related to touch. HGH promotes nerve rejuvenation, myelination, neuronal arborization, glial differentiation and cognitive function. Dr. Elmer Cranton tells of a male patient in his fifties afflicted with a hereditary form of paralysis. At the time he was started on HGH he was wheelchair bound. After a few months of HGH replacement he was able to walk again. Follow-up with the patient a year later found him still walking despite his progressive genetic defect. 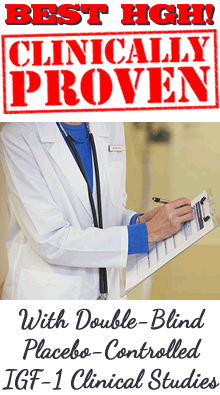 As more and more doctors are treating patients with human growth hormone we are hearing more reports of patient improvements pertaining to neurological disorders such as multiple sclerosis, Alzheimer's, Parkinson's, senile dementia, and stroke. Patients with neurological injuries are also seeing improvements. It is important to note that with HGH therapy some improvement may occur within weeks, however, optimum benefits may require several months or even years of ongoing therapy. Human growth hormone is the body's growth and repair hormone, it works by stimulating the steady healing, rebuilding, and replacement of healthy cells, which takes time.